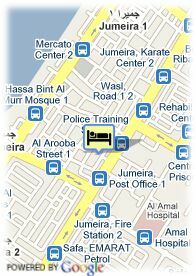 Villa 18 Street 83B Jumeirah 1, 212930 Dubai, United Arab Emirates. Hotel La Maison D´Hotes has a magical atmosphere due to the combination of arabian style and a modern occidental decoration. It is located in jumeira, one of the most exclusive areas of dubai, la maison d'Hôtes is placed right in the historical, leisure and business centre and at just 5 minutes from the beach. In La Maison d'Hôtes you will enjoy the movement of the city without leaving the quietness due to the intimate and familiar atmosphere which characterizes this establishment. This hotel from Dubai provides 20 elegant guestrooms fully equipped, outdoor swimming pool, fitness centre and services for massages and beauty, as well as a restaurant with French gastronomy and several international touches and vegetarian food.